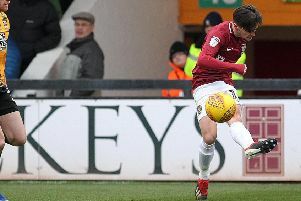 Cobblers boss Dean Austin admits he has a ‘massive selection headache’ ahead of Saturday’s Sky Bet League Two clash with Lincoln City. Town host the Red Imps at the PTS Academy Stadium (ko 3pm) on the first day of the new season, and Austin has a fully fit squad to choose from with both Shay Facey and Junior Morias expected to be available after recovering from ankle injuries. The manager has been delighted with his players’ attitude and application throughout a pre-season campaign that started back on June 23, and he admits whittling down his squad to an 11-man starting line-up is going to be no easy task. But he also made it clear he believes he has the ruthless streak required to do what is right for the club. Asked if these are exciting times as he prepares for his first season as a Football League manager, Austin said: “I try not to get too excited, and to start off with I have got a massive selection headache at the moment. “I have nice problems, but some really tough decisions to make. “That is only because of how well everybody has done in pre-season, everyone has worked really well, but this is part and parcel of the job. “I do care about my players and I have got very good lads, but I am also ruthless enough that I know the decisions I have to make. “I am looking at it and I am feeling very, very good about my squad. “I have a good feeling about the players I am looking at every day in training, and I look in their eyes and they are all keen, and they are all ready to play. Austin is a manager who leaves no stone unturned in his preparations for any game. So is it difficult to prepare for a clash on the opening day of the season when the opposition has brought in new faces and, in Lincoln’s case, have been tinkering with a change in formation in their own pre-season? “It depends how many new players have been brought in,” admitted Austin. “If teams have brought a lot in, then it can potentially be more difficult to prepare, but to be honest I am not really that bothered in what they have been doing. “I am more interested in what we have been doing, and what we need to do moving forward. “We respect every opponent a lot, but we understand what we need to do, and everything with us is trying to play our way, and to try and exploit the weaknesses we can find in the opposition.